Buy a Vaseline body lotion to get a chance to win an all-expense paid trip to Boracay for 4! Or Forever21 GCs or an iPAD mini. I mean seriously, everywhere I look it's still a win-win situation, it really is worth a try right? Read the poster mechanics to join, it's SUPER easy. 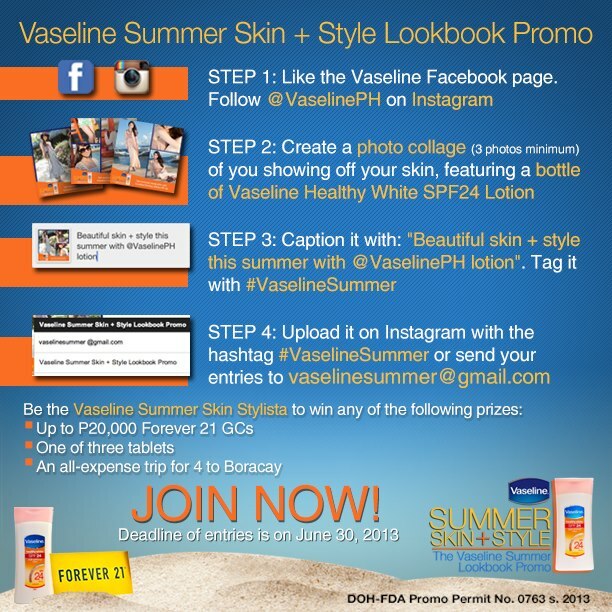 Or click through to go to the Vaseline PH facebook page. on this space to solve my problem. Maybe that's you! Taking a look forward to see you. All the more you should flaunt it!!! I just joined as well and I hope I get to win Gift Certificates at the very least. :D Good Luck to you!